This picture was taken in 1946 after World War II. Back Row: Our teacher Miss Annonson’s brother with the uniform on, he came and visited her at Long Lake School, Gordon Whitney, Glen Johnson, Donald Ancke, hidden behind Beverly Rydeen is Leighton Natt, Dorothy Whitney and Kathryn Johnson. Middle Row: Raymond Krech, Karen Berglund, Darlene Whitney, Irene Ancke, Shirley Rydeen, Jeanette Johnson, Beverly Rydeen, Darlene Krech, David Klinefelter and Ai Cronk. First Row: Yvonne Carlson, Sharon Natt, Karen Bengston and Roy Johnson. MODERN ADDRESS Located at Square Lake Trail and Norell in the town of May. DISTRICT BOUNDARIES Big Marine Lake marks the northwestern corner of the district, while North Terrapin Lake marks the southeastern corner. 1868: A proposal is written to organize District 50 from 5,6, and 7. 1871: Long Lake School organized. Classes are held in the home of Andrew Carlson. 1876: The first school is built on land owned by Nels Weberg. 1890: School moved to present location. 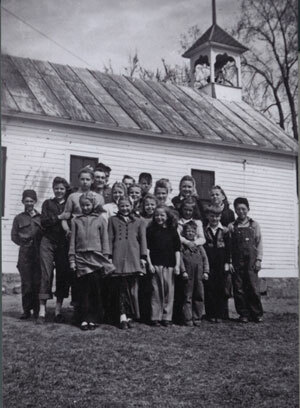 1952: Long Lake School closes. Enrollment in 1876: 13 students. In 1898: 35 students. Charles Strathern, Annie Lynch, Nelie Clifford, Agnes Harrington, C.O. Chilgren, Margaret Barry.